Do you have a big dream that you want to make come true? Do you want to move to the other side of the world and don’t know where to start? Leave the corporate world behind and have a life of freedom? Do you know that if you could access your inner database your life would be so much easier? You would finally have the clarity to have the results you crave. Let me unleash your psychic powers so you can move to the next level. You know there’s more to this life. You’re not necessarily unhappy, but you have a quiet voice inside that whispers your big dreams, your secret desires, and your innate knowledge that maybe, just maybe, something is missing. Maybe it’s depth or meaning or richness. Maybe you want to start your own business, or write a book, or move across the world. Maybe there are people in your life that you think you should move on from. But, how do you know if that little voice is right? How do you trust it? You’ve been wrong about things before. How do you take a big leap or follow a big dream when it’s so risky? Twenty years ago I started dreaming about moving from Europe to Australia. I wanted to live close to the beach, have a nice pool, time to read books, write a bestseller, get married, go horseback riding when I feel like it, and help other people to make their dreams come true. Ten years ago I made the move to Brisbane and since then I have been turning my life around completely. The amount that I could have spent on a nice car I invested into personal development and spiritual awakening practices. I read every book I could get my hands on to help me realise my dreams. Finally, I discovered the way to take those last steps to personal freedom, success and happiness. You have to unleash your authentic, psychic self to step into the real you. Are you ready to gracefully receive the things you have been trying so hard to manifest? If your heart says YES then it is your time to learn in only a couple of weeks the essence of what took me over twenty years. Why not send me a message and we can have a chat to see if this program is suitable for you? Join me today to learn how to tap into your inner wisdom so you can be confident about which voices to listen to and which ones to gently ignore. I AM READY TO UNLEASH THE REAL ME! Early Bird ends 8th February! I want us to feel fantastic about working together and I will make sure these five weeks will give you the value back of your investment. It is the next best thing as being coached by my personally and super affordable. I have a special bonus for quick decision makers, ask me about it! What can I expect the course to look like? There will be 5 live video calls with zoom, each minimum 60 minutes. There will be Q&A at the end so can be sure all your questions will be answered. During serious personal work like this, resistance will arise and I will personally take care of this to make your road as smooth as possible. Can I watch it later if I can’t make the live video calls? Yes, you can. All sessions will be recorded. You will have access to the course at the time that suits you best. When you truly are ready for transforming your life you want a seasoned, trusted guide for when things become difficult during this process. I have guided many people to become unstuck. Let’s have a chat to see if I can fulfil that role in your life too. Wednesday 22 February 7 am Sydney time. Click here to check your time zone. When is the last module live? How do I buy and what happens once I purchase? I strongly believe in what I offer and do not find it necessary to offer a refund. I work with people that are fully committed and that don’t look for a way out before they begin. If you want to know me better before committing come to my free events, read my memoir. You can also send me an email with your questions so we can both be sure this is a good choice for you. 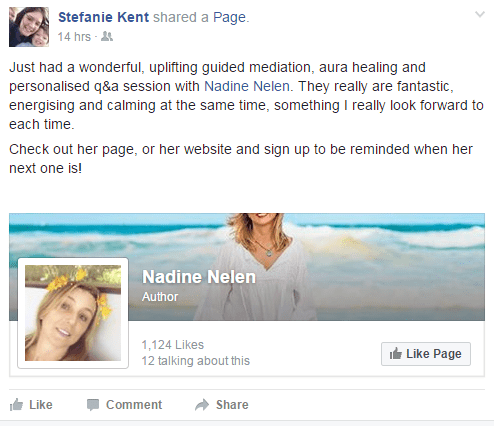 Nadine just blew me away with how accurate and soul touching her psychic healing was… She told me things about myself that went to my very core, and helped me see myself in a whole new light! But more then just telling me – she helped me heal on a deep level. I myself am a healer, coach and leader online, and because of this work I can get quite ungrounded sometimes, She tuned right into that and helped to ground me – plus she gave me some special homework. She didn’t know this but I love being barefoot in nature it is very healing for me. During the sessions she told me that I needed to be outside barefoot on the grass – something I hadn’t done for a while, even though it is one of the number one things that makes me feel happy and whole. The next day I felt grounded, refreshed – but so much more confident because of the messages she gave me. She had tuned into a past life of mine and contacted a spirit guide – the things she told me about my power to transmute energy and heal were exactly how I see myself, but now I know it goes back centuries. It was incredibly special. I highly recommend you work with her to help you remove your blocks so you can be more successful, more fulfilled and aligned with what you want and who you truly are.